This dress had a few highs and lows during the making process but I'm happy to say that it ended on a high. I bought this amazing fabric a year ago without a clear plan, or any plan really, for how I would use it. A few weeks ago, I settled on the perfect pattern for the fabric and got to work. I settled on Vogue V8901 but was worried about the fit because of it's unique lack of side seams. I started out by making this muslin, then I made a second bodice muslin out of cotton to get a better feel for how the pattern would work with this fabric. Below is a photo of my adjusted pattern on top of the original. You can see that I moved the shoulder in, lengthened the bodice and added to the sides to provide more coverage. At last feeling satisfied with my pattern adjustments, I laid my fabric out to start cutting. This fabric was a couple of inches shorter than the fabric I used for my wearable muslin so I had to stagger the rather wide bodice pieces more than I had expected. Then I freaked out that I didn't have enough fabric. I folded it up and started thinking of other plans! I pulled out my box of dress patterns and started looking through it. Did I mention it was probably after 10pm? Yeah, that's how I roll sometimes. I started to slow down and decided that I might have been too hasty. So I spread the fabric out on the floor again. Placed my pattern pieces on top and measured what I had remaining. Low and behold it was enough for the skirt. Phew! Just like with my muslin, I did gathers instead of pleats for the skirt. To make the skirt, I just cut a length from the fabric and made one seam at the center back, then repeated for the lining. Super easy! The fabric is an amazing textured cotton printed with abstract birds from The Fabric Store. It's really hard to describe and I've never seen anything like it so here's a close up! It's almost like there's an applique texture in geometric shapes, then the abstract birds on top. See how it looks thicker in some places? Super cool, right?! I had the dress all done with zipper in and lining stitched in place when I decided that it needed to be a little more fitted. So, I unstitched at a couple of places on the waist and made some adjustments. I took in the top edge of the bodice a smidge and overlapped the front and back pieces more, shifting the ends of the bodice down and trimming off a wedge from each side. 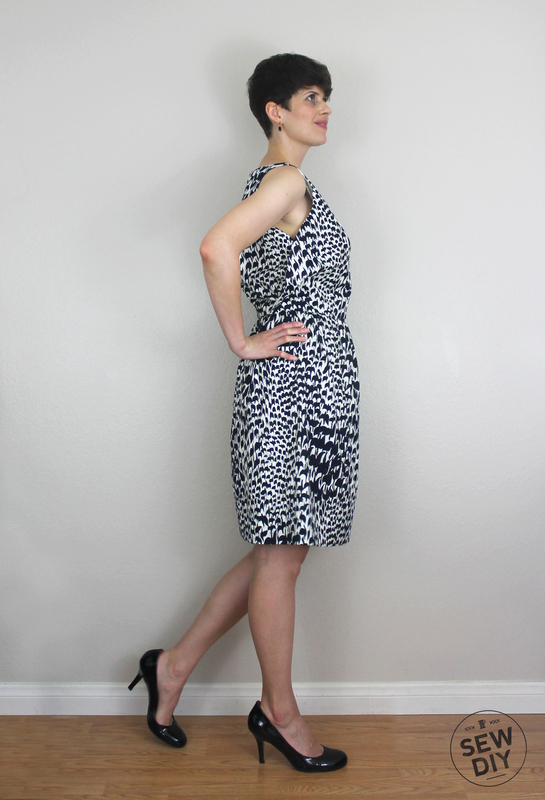 This dress is a little more fitted than the muslin, which works well for this fabric. I tacked the sides together at the armpit but it still gapes a little bit as you can see in picture above. I'm thinking I might tack it in a few more places but I'm not sure. Maybe it's ok as is? This photo gives a pretty good visual on how the sides overlap. I'm really happy with how this turned out and excited to wear it this weekend at the wedding. Here, I'm wearing it with my Nine West Pumps but I might end up wearing some new shoes that have a lower heel, for the sake of comfort naturally.